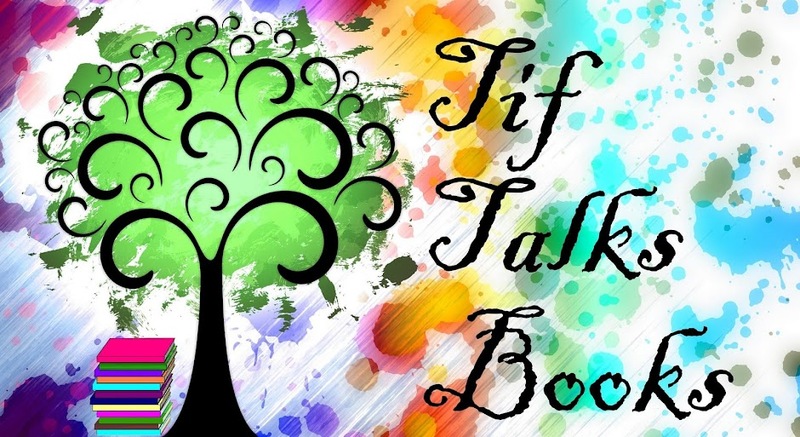 TIF TALKS BOOKS: The Shining Read-along Kick-Off!!! 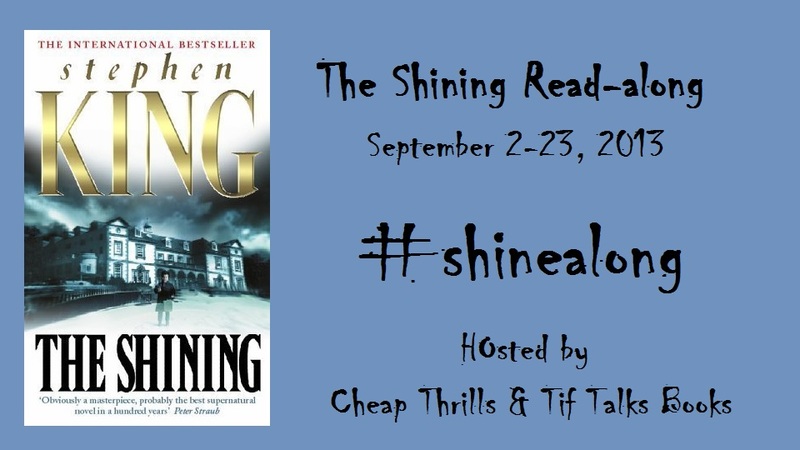 Today is the day that we kick off The Shining read-along!!! 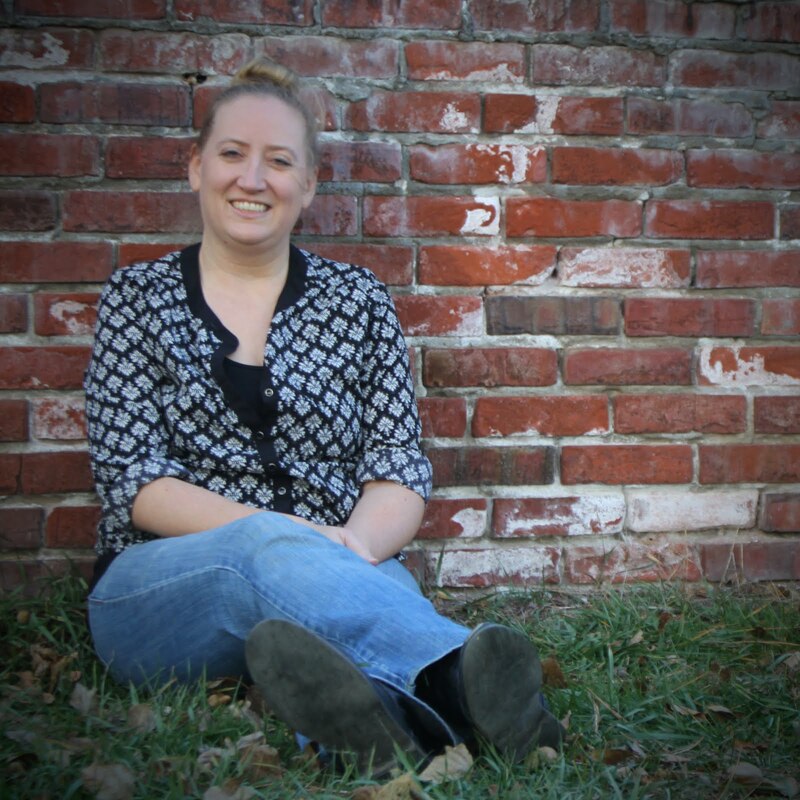 I am so very excited to revisit this book and to do it with all of you! In case you missed the big announcement, Charleen from Cheap Thrills: a book blog and I have teamed up to host a read-along for The Shining, the classic horror novel from Stephen King. We have timed it perfectly to coincide with the release of his sequel, Doctor Sleep, which revisits Danny in middle-age. As a reminder, here is our full schedule . . .
Monday, September 2: Kick Off! Tuesday, September 24: Doctor Sleep Released! And now for a SPECIAL ANNOUNCEMENT . . . Charleen and I are excited to announce that we will also be hosting a read-along for Doctor Sleep! We will kick off reading on Monday, September 30 to allow for everyone to get their hands on a copy and wrap up on Monday, October 21. More details will be posted here as they become available as well as on Twitter with the hashtag #sleepalong (to keep with our hashtag #shinealong this time around). 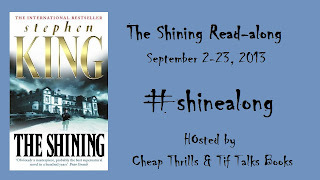 Now, let's kick-off The Shining read-along with a few introductory questions. Please feel free to answer any or all of the questions, either in the comments section or by linking up below. I have included my own answers for your enjoyment. Please Note: Since we will have some first-time readers and those that read ages ago, please do not include spoilers OR have them clearly marked to avoid ruining the story! Will this be a re-read or a first-time read for you? I will be re-reading; however, my first read was AGES ago, so it may be almost like a born-again read for me! I do remember key pieces of the story, but the details elude me. Have you seen the movie(s)? Yes, both of them! I started out with the classic film (1980), featuring Jack Nicholson as Jack Torrance. Then, I hunted down the made-for-TV version (1997) to compare, featuring Steven Weber as Jack Torrance. I like to read the books before I watch the movies. With this in mind, I had a very specific idea going into the classic film, and found myself to be disappointed by everything that was changed. However, Jack Nicholson did a brilliant, freaky job of Torrance's character. In the made-for-TV version, I preferred the details because it stuck closer to the book, particularly the ending. Steven Weber did an okay job portraying Jack, but Nicholson's performance is and always will be hard to match. As for my thoughts on the book, I liked it a lot! King can reach into the human psyche (psycho) better than just about anyone else, capturing frightening and potentially realistic people and situations all too well. It is not my favorite King novel, but it is one of the highly-ranked ones. And finally, why are you joining in on the #shinealong? Is there anything specific you would like to get out of the read-along? I am really looking forward to re-reading this book and chatting with others about it as I experience it for a second time. And, I am excited to revisit the world of the Torrance's before diving into Danny's world so many years later via King's sequel. Don't forget to follow the conversation here and on Twitter using the hashtag #shinealong! Time to get your "shine" on!! Yay! So glad that you told me about the shinealong! I can't wait to revisit it. 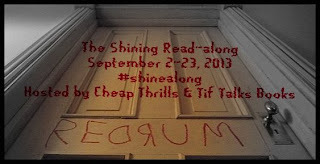 I'm glad that you guys came up with this idea...I love an excuse to reread The Shining! :) I'm very excited to talk with everyone about it.